When I heard the news of the death of Anne McCaffrey – science-fiction author and creator of the Dragonriders of Pern series, the Ship Who Sang, and the Crystal Singer series, among others – I cried. I’ve never had the pleasure of meeting the woman, but she was indubitably my hero. 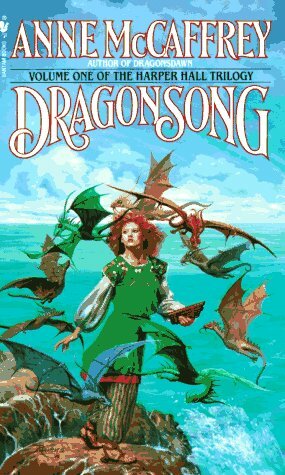 When I was about 13, I stumbled upon Anne McCaffrey’s novel Dragon Song in the local library. I was hooked. Over the following years, I sought out everything she had written and devoured it. Ms. McCaffrey’s ability to create a complete world in which you could completely lose yourself was incredible. I know I’m not the only person who, to this day, desperately wishes to own her very own fire lizard! Besides being incredibly gifted at world building, what stands out most to me about Anne McCaffrey’s stories is what she did for women in science fiction. For the first time in my life, I was reading fantasy/sci-fi stories in which females were the undisputed MAIN characters. At the time, most of the classic stories I had been exposed to had been written by men and featured male protagonists and women and girls were little more than window dressing or plot devices, but Ms. McCaffrey put forward leading females who were real and strong, gritty and vulnerable and flawed. And I mean these women were FLAWED; they were damaged goods, emotionally and physically. Just like all those girls and women who read her stories and saw themselves in her characters, these women fought and scrapped and overcame. At the impressionable age at which I discovered her novels and short stories, the idea that a woman could go through hell, deal with her baggage, and still win the day was a revelation to me. This idea has embedded itself deep in my psyche and informs by personal worldview every day. Thank you, Anne McCaffrey, for all the ways you’ve touched my life. Fly far and free on dragon’s wings.